Sally Wallis has decided to 'retire' after 26 years on the committee as Membership Secretary and Honorary Treasurer. Wally Kneale has stepped down as Chairman but will continue on the committee as Vice Chairman. Allan Brew was elected Chairman, Carole Moreton becomes Honorary Treasurer and Janine Brew elected onto the committee taking on the role of Membership Secretary. Andy Moreton and Bill Robinson were re-elected to the committee and Lea Robinson continues as Secretary. In his new role as club Chairman, Allan Brew wishes Sally all the best in her 'retirement' and said that the Manx Grand Prix Supporters Club owes Sally a huge debt of gratitude for all the years and time that she and her late husband Vern Wallis had given to the club. Sally will be sorely missed, but I know that I can always call by for any help or advice and hopefully one of Sally's famous cakes ! Allan also wanted to thank Wally Kneale for his fantastic work over the last two years, when he stepped into the role of club chairman under very difficult circumstances, when the previous chairman, Bob Taylor passed away in November 2013. Allan also said that he was very relieved when Wally decided to continue on the committee as Vice Chairman. 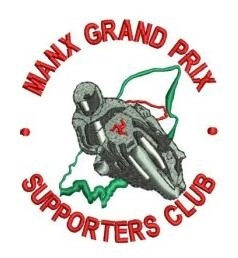 The Manx Grand Prix Supporters Club celebrated its 40th Anniversary this year, 2015 and was initially formed to ensure that a rescue helicopter was on standby throughout practice and race weeks for the Manx Grand Prix. To date it has donated in excess of £750.000 to the Manx Motor Cycle Club, ensuring not only that the helicopter is in the skies during the MGP, helping with the purchase of other vital medical equipment and also helping any injured competitors with early financial assistance as they recuperate. All the money raised by the Supporters’ Club comes through donations from the public, both during the MGP and throughout the rest of the year. The Club organises a host of activities, from sponsored walks to pass-the-bucket collections, from tea and cake sales and the annual mhelliah held at the Sulby Glen Hotel.